If you want a vanity that is both stylish and useful, this modern vanity is perfect. The white acrylic counter and off-white mdf base make a beautiful look in your bathroom. With drawers and double-door cabinet, this vanity set is also great to keep items in. Put a nice twist on your bathroom project with this classic piece from Cutler Kitchen Bath. For some added modern style in your bathroom, choose this beautiful vanity. Made with a special white solid wood base and a off-white artificial stone counter, this piece will make your bathroom look even nicer. This set from Art Bathe is great for anyone looking for great style and function in their bathroom. The Fresca Kingston Antique Silver Traditional Bathroom Vanity w/ Mirror features a gorgeous Carrera Marble 1 bullnose edge countertop with 4 backsplash and white ceramic undermount sink. The vanity itself has intricately carved columns, decorative moulding and dentil cornices that elevate its beauty. With two doors and six drawers, this vanity has great storage space. Satin nickel handles add to its elegance, while a matching rectangular mirror completes the look. This lovely vanity is available in multiple sizes and makes a stylish statement in any home. 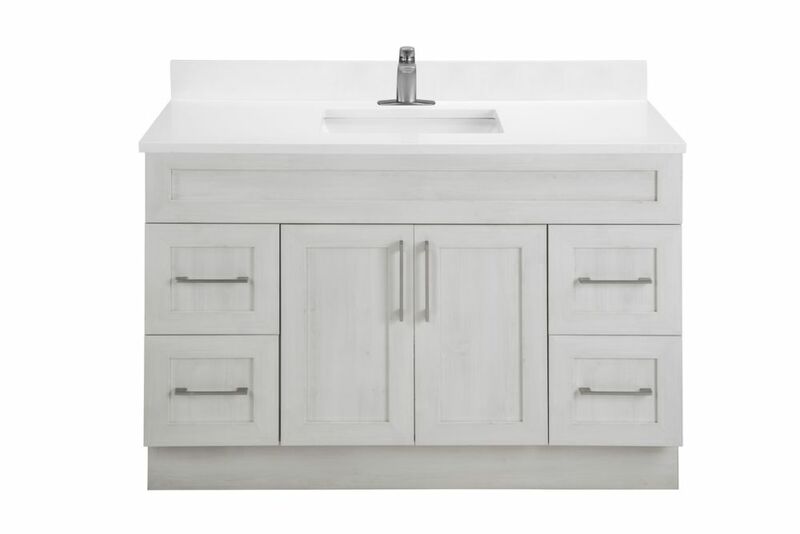 Fogo Harbour 48-inch W 4-Drawer 2-Door Freestanding Vanity in Off-White With Acrylic Top in White If you want a vanity that is both stylish and useful, this modern vanity is perfect. The white acrylic counter and off-white mdf base make a beautiful look in your bathroom. With drawers and double-door cabinet, this vanity set is also great to keep items in. Put a nice twist on your bathroom project with this classic piece from Cutler Kitchen Bath.